Just a small maintenance update. I’ve got a test image that was generated procedurally. ZX and C64 modes: bayer dithering now uses 4×4 matrix. 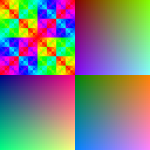 Fakemode: more precise color calculation. New color bit depth reducer. Supports any combination of 1 to 8 bits per channel with optional dithering. It’s not just a simple rounding. It calculates the closest target level that produces minimal error. This results in less grainy dithering and better quality at any bit dept. 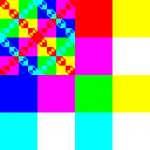 This entry was posted in Computers, Java, Personal blog, Retro equipment and tagged Amiga, atkinson, Bayer, bitdepth, dithering, floyd-steinberg, HAM, ham_convert, HAM10, HAM6, HAM8, Hold-And-Modify, java, RGB, zx, zxspectrum by mrsebe. Bookmark the permalink.